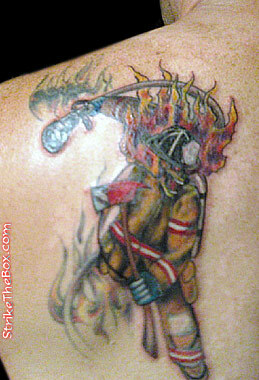 Editor's Note: The inspiration for this tattoo is from a painting by the remarkable artist, & firefighter, Allan Albaitis. The painting is entitled 'ASSASSIN'. To purchase a print visit Allan's site at FireArt.com . Description: Started as a cover up, did not like the initial ink and had it re-inked last year. Currently having a full back piece being added.